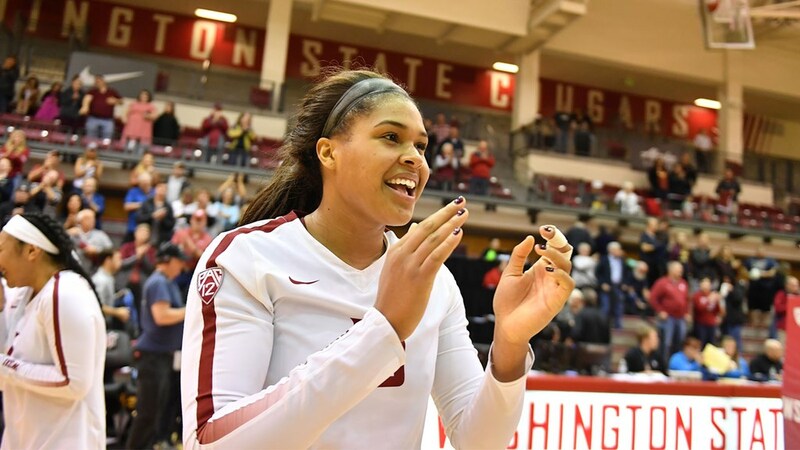 Washington State senior outside hitter Taylor Mims missed her 5th-straight match on Friday when her team played Colorado. Mims left the team’s 3-0 loss to #2 Stanford on October 12th after an attack error late in the 2nd set with a ‘lower leg injury.’ She still led the team with 12 kills in that match, in spite of missing the entire 3rd set. Mims has 262 kills and is hitting .243 this season, and still ranks 2nd on the team in kills in spite of missing the last 5 matches. Her 3.97 kills/set is also the team high, half-a-kill higher than McKenna Woodford. Cal, who have won 3 of their last 4 matches and are suddenly a hot team, beat Washington State on October 14th – their first match without Mims – but the Cougars have won 4 straight. That includes a 3-2 win over USC and a 3-0 sweep of UCLA, both top 25 teams. Setter Penny Tusa has been forced to outside hitter in Mims’ absence. She had 19 kills against Colorado with 11 errors and hitting .136 – making her the team’s 2nd-leading scorer behind Woodford (22 kills, .190 hitting). Washington State won in spite of hitting just .175 as a team. Full Pac-12 Friday recap here. Colorado is Washington State’s only opponent this weekend, and they’ll return to action on November 2nd against Arizona and November 4th against Arizona State at home. While no information has been shared about Mims’ absence, she did post a photo album to her Instagram account on Tuesday without any visible braces, wraps, or costs on her legs.